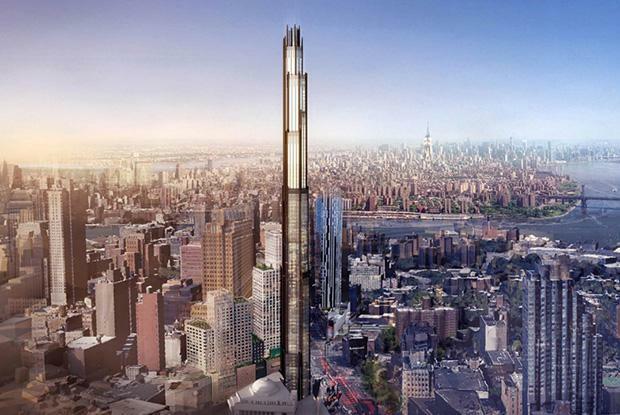 Supertall skinny towers are all in vogue in Manhattan and not even neighbouring Brooklyn is immune with this week’s unveiling of plans for a 1000-foot (305-metre) tower at 340 Flatbush Avenue. It would have the honour of being the tallest skyscraper in New York outside of Manhattan, dwarfing everything in its immediate surrounds. Reported in New York YIMBY, an information service on new development in New York City, the architect is New York-based SHoP Architects and backed by JDS Development Group – a development, construction and acquisition firm based in New York with over seven million square feet of property under development. The tower is expected to have about 90 storeys and containing 550 residential apartments and having a significant commercial component. Tentative completion is slated for 2019. Brooklyn’s skyline has been growing since 2004 when several areas of Downtown Brooklyn were re-zoned to promote more commercial, residential and retail developments. The current tallest building in Brooklyn is the 180-metre 338 Bridge Street residential high-rise building completed in 2014. SHoP, JDS and Property Markets Group are developing a skinny 411 metre skyscraper (taller than the Empire State Building) on fashionable West 57th Street on a plot that is just 13 metres wide. It will be the slenderest skyscraper in the world and due for completion in 2017. Holl says that these buildings increasingly have no public space unlike the Rockefeller Center and Empire State Building and effectively shut the rest of the world out. 432 Park Avenue, New York. One of the new wave of Skinny Skyscrapers across New York. Image from Flickr user Ikaloti[/caption]The many advancements in building technology and structural design are helping fuel this wave of slender buildings. The advancements are turning previously considered too small lots into premium development sites. It also helps that there are many wealthy people willing to pay premium prices in skinny towers with unobstructed views of iconic landscapes like Central Park.